Jump to the basis sets and downloadable files here: files, 6-31G, 6-31Gd, 6-31Gdp. If you use these results: Please drop me a line (damian@somewhereville.com), just to keep track of where this does some good. That said, you should most certainly cite the EMSL and Basis Set references at the bottom of this page. It’s a fair bet that Sir John Pople would be the world’s most cited researcher by leaps and bounds if people properly cited their use of the basis sets he helped develop. The full 6-31G, 6-31G(d), and 6-31G(d,p) series (yes, adding 6-31G(d) is a bit of a cheat in this list) from the EMSL Basis Set Exchange is presented here in the interest of giving the general CRYSTALXX (that’s CRYSTAL88, CRYSTAL92, CRYSTAL95, CRYSTAL98, CRYSTAL03, CRYSTAL06, CRYSTAL09, now CRYSTAL14 – providing the names here for those who might be searching by version) user a “standard set” of basis sets that are, for the most part, the same sets one does / could employ in other quantum chemistry codes (with my specific interest being the use and comparison of Gaussian and GAMESS-US in their “molecular” (non-solid-state) implementations). Members of the CRYSTAL developer team provide a number of basis sets for use with the software. While this is good, I will admit that I cannot explain why the developers chose not to include three of the four most famous basis sets in all of (all of) computational chemistry – 3-21G (upcoming), 6-31G(d,p) (presented here), and 6-311G(d,p) (also upcoming). More “But why?” There are, generally, many basis sets available for most of the Periodic Table in the CRYSTALXX Basis Set Library. In terms of consistency across all calculations to the molecular-centric quantum chemist, the 6-31G(d,p) series is the cut-off family of basis sets for many, many projects in all computational chemistry research – the series is just large enough to provide predictions “good enough” for publication but is also small enough that systems will properly optimize in a reasonable amount of time for standalone use or as “beautification” calculations for larger basis set studies (this is specifically true for crystal structure optimizations, as considerable time can be wasted simply “cleaning up” hydrogen atom (R-H) bond lengths, which are notoriously underestimated by approx. 10% in X-ray studies (but neutron methods give poorer lattice constants generally, so you can’t win for quick clean-ups either way)). Furthermore, 6-31G(d,p) is the “B3LYP” of basis sets – one that most everyone has used in structure optimizations and one that is constantly run across in computational quantum chemistry studies among typical non-hard-theory quantum chemists (which is not meant to be a slight to the broader user base using computational chemistry for its interpretive value – it’s my workhorse basis set for many past studies). These two points drove the conversion all of the published 6-31G(d,p) basis set data to CRYSTALXX to have it generally available as a solid-state density functional theory (DFT) tool. When one thinks of the variational principle, one doesn’t often see the choice of software as being a mechanism to a achieve a lowest energy for a system. While it would be really nice if each program agreed on the lowest energy for a basis set (which, theoretically, seems like it would be the correct result), different programs use different approximations, internal tools, and convergence methodologies to “reach bottom.” Within the same code, these approximations, tools, and methods are, assumedly, “internally consistent” and, obviously, it is safe to compare those apples and apples on Apples. For those looking for a more detailed study of the differences (by energy) of various quantum chemistry codes, I direct your attention to – Journal of Molecular Structure: THEOCHEM 768 (2006) 175-181 (Concerning the precision of standard density functional programs: GAUSSIAN, MOLPRO, NWCHEM, Q-CHEM, and GAMESS), a paper I stared at for many minutes in trying to come to grips with the energy comparisons when I first started the testing. Obviously, just presenting coefficients on a blog post and expecting people to trust their use blindly for peer-review publications is a non-starter. Simply doing the conversion itself for in-house studies without some kind of comparison to other energies with tested formats is also a non-starter, as a single wrong number or exponent throws the whole basis set into question (and, admittedly, I fought for several days with helium energies before discovering I’d … misplaced one electron in the conversion process). Therefore, part of the conversion process includes a series of tests comparing the results of Gaussian09 and CRYSTAL09 (not timing tests, simply final energies in an attempt to get the CRYSTAL09 energies to look like the other energies enough to trust that the basis set conversion was successful). What you learn from performing this type of study is the extent to which quantum chemistry codes can differ significantly in their treatment of integrals, functionals, grids, and convergence criteria. As a way out of part of these problems, the best way to perform comparisons is to run good olde Restricted Hartree-Fock (RHF) calculations, avoiding functional and grid size specifications. Convergence methods and integral treatment may still differ, but it’s possible to get agreement between Gaussian09 and CRYSTAL09 to within 10^-9 Hartree (and even this can get better). Routinely hitting very small energy differences is my way of believing the correctness of the basis set conversions, but I provide all of the files associated with this project below for your own analyses. You are, of course, welcome to (and encouraged to) perform some sample runs of your own before setting out on a full computational project. Correlation: (81% LYP non-local correlation + 100% V5LYP VWN5 local correlation). And these differences are for single atoms. The He might look OK-ish to untrained eyes, but the Ar numbers differ by 182.7 kJ/mol (that’s approaching half a C-C bond worth of energy – nothing to attempt comparisons with), showing that these are two very different density functionals. If you’re performing multiple operations in a single input file (and I don’t mean the use of “Link1” – I mean optimization and frequency calculations in the same Link0. If you see Gaussian rehash the top of the log file in a run after an operation as if it were running a new file, that’s a new operation), you learn the hard way that “iop” keywords do NOT carry over property prediction operations in Gaussian calculations. Which means what? If you run and opt + freq in the same input file keyword series, the opt will read the iop settings but the freq will ignore them (which I find to be mildly ridiculous). For those keeping track, the 4451 cm-1 mode is the energy of the vibration at the B3LYP/6-31G(d,p) level for an H2 molecule whose H-H bond length is that of the alternatively-defined B3LYP density functional. Run an opt + freq with iop specs for the functional, you need to either use a compound input file format (below) or be ready to run, for instance, a freq calculation by taking the coordinates from the optimization calculation, doing so in two separate Gaussian calculations. Your compound input file would look like the one above. The CRYSTAL FAQ (as of 2014 Jan 14) states the following concerning the reproduction of Gaussian/CRYSTAL results with CRYSTAL/Gaussian. > There are 3 main differences between a standard CRYSTAL run and a GAUSSIAN run. As test cases to show what keywords needs to be included for each calculation, they provide the following neopentane example (using the same geometry for both, with the CRYSTAL geometry symmetrized to unique atoms) at the RHF level (avoiding the DFT issues altogether). Running these two calculations give you an energy difference of 0.0000003255398 Hartree. Technically, the GAUSS98 keyword doesn’t gain you anything except a Gaussian-friendly coordinate file (but I include it here anyway). This brings your CRYSTALXX into correspondence with GaussianYY, not vice versa (re: B3LYP, cut-offs, etc.). Density functional theory calculations are sensitive both to the proper specification of the density functional (see above for B3LYP) and the fineness of the grid (if you’re doing grid-based DFT). Unfortunately, there isn’t an exact correspondence between the grid specifications of the two programs (or the treatment of the grids in the two programs), which means there isn’t a way to exactly zero-out the differences between this part of the energy comparison for the two. I suppose one could attempt to run infinitely fine meshes to see what happens, but I’ve not seen it reported. That said, there’s enough correspondence in the different qualities of pre-defined grids to get you close enough to, again, wave off differences in the two energies to issues not related to the basis sets themselves. Calculations were performed at the B3LYP/6-31G(d,p) level with the [insert program name] program. … and if you’re just using program defaults (which is what is assumed when no other information is provided in the Methods Section), there’s no shame in stating that as well. Again, a few pre-defined grids are available. In GAMESS, you specify the components. and "army grade" is NTHE=36 NPHI=72. I am pleased to report there appears to be no difference running Gaussian with the built-in 6-31G(d,p) and using the EMSL Basis Set Exchange 6-31G(d,p) set (this fact was not obvious at the beginning of this test), but ONLY with the 5D and 7F keywords (specifying the number of angular momentum functions to use for the d and f shells) added (the EMSL basis sets will produce the same results either way. Gaussian’s behavior with its internal basis sets DOES change). By that, I mean the following for Argon with the B3LYP and B5LYP (B3LYP alt.) functionals. NOTE: Those lines with 5D 7F show identical energies for the B3LYP and B5LYP pairs. The others, not so much. My practice with this phenomenon came from optimization attempts of Cl2 (one of the more difficult structures to get into agreement with the two codes early on). While Gaussian will generally take any number of starting geometries and produce the same result, CRYSTAL optimization is found to be very sensitive to the starting geometry, with closer initial Cl-Cl distances producing better agreements with Gaussian. As a point of larger discussion, it is well known that one of Gaussian’s great benefits over several other codes is the quality of the convergers – you may not like the answer, but Gaussian is, generally, very good at finding minima. Where you have problems, you either have lots of keywords to adjust or lots of behind-the-curtain operations Gaussian does to attempt to find better geometries. Generally, CRYSTAL and Gaussian settled on the same structures. For some cases, the two disagreed on geometry, energy, or both when optimizing dimers (granted, the first row transition metals can be a tough block to make dimers out of), leaving one to “swap out” the optimized geometries from both programs to see if they, at least, agreed on the minimum from code A being an identifiable minimum in code B (which was generally, but not always, the case). Finally, it should be stated that the energy analysis was performed to test if the basis sets were correctly converted, NOT to test the programs. I spent as much time as I thought reasonable on this analysis but ran into a few cases that tested my knowledge of keyword combinations and, more generally, tried my patience. That’s Ar, Be, Ca, He, Mg, Ne, and Zn. That’s H2, Li2, B2, C2, N2, O2, F2, Na2, Al2, Si2, P2, S2, Cl2, K2, Sc2, Ti2, V2, Cr2, Mn2, Fe2, Co2, Ni2, and Cu2. The dimers and singlets combination grew out of an early frustration when trying to get doublets to be well-behaved in CRYSTAL09. For instance, I could not get CRYSTAL09 to give me an UHF energy for the single Flourine doublet. It should be obvious that dimerization in all of the non-full shell cases simplifies life by allowing you to always define a system with a RHF wavefunction (no unpaired electrons, even if they really, really want to be). This approximation in all cases has less to do with a lacking working knowledge of transition metals (but, hey, it has been a while) than it does with an interest in computational expediency. If CRYSTAL and Gaussian can be made to produce identical structures, I believe the basis set conversion even if I don’t believe the reasonability of the optimized structure (which is to say, I did spend significant time getting Gaussian and CRYSTAL to produce the same structure, but didn’t spend any time the best geometry from sets of optimizations). That’s AlH3, BH3, CoH3, H2O, H2S, KH, MnH5, NaH, NiH2, VH3. The production of energetic minima among transition metal homodimers is complicated in the two codes by the presence of multiple minima for these species (we’re talking lots of ways to combine electrons). O2 and S2 Hartree-Fock calculations proved to be annoyingly problematic despite several efforts. The energy difference between the low-spin (singlet) and high-spin (triplet) cases produced too-small numbers in CRYSTAL09 compared to Gaussian. Boron is just naturally poorly-behaved, Aluminum less so. Manganese and nickel were a serious fight to get RHF values to agree. Na2 and K2 weren’t bad, but I thought the agreement could get better (hence NaH and KH). Same for V2 (in the form of VH3). 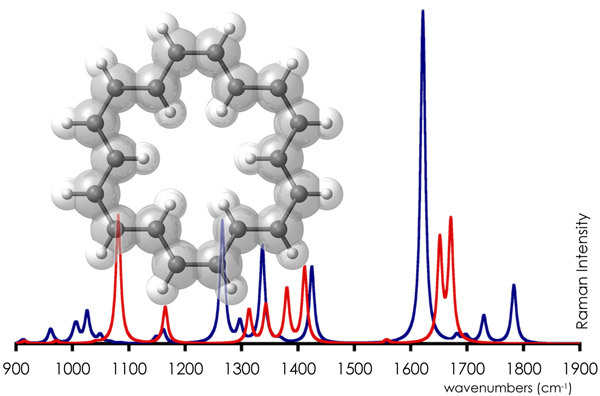 For a selection of cases, the homodimers are reported (to show how badly they behave), but the appropriately valence-satisfied hydrides for these elements are also reported (where it is shown that the energies between CRYSTAL and Gaussian look great). NOTE 9: What’s Good Enough? As too much text above explains, getting CRYSTALXX and GaussianXX to agree to too many significant digits by DFT is more work than it’s worth. Getting Hartree-Fock (esp. RHF) to agree to within narrow tolerances is not a problem provided you really beat on the energy criteria and structure optimizations. A summary of the energy differences between Gaussian09 and CRYSTAL09 for RHF and “best case” DFT are provided below. RHF is my guide here to prove that the basis set conversion was successful. The DFT results show how “very high quality” Gaussian09 and “very high quality” CRYSTAL09 still differ in their final energies. As discussed in NOTE 4 above, you need to specify several parameters to make Gaussian and CRYSTAL agree. In the interest of complete overkill, I decided I wanted to know how the keyword combinations change the final energies from the runs. To that end, the summarized energies from all of the runs performed for the analysis is a bit exhaustive and full of lots of identical data (which is a good thing). These keywords are summarized below. As is a habit, all of the files are named with the relevant keyword combinations in the filenames themselves for ease of sorting. Differ by the specification of the grid. You will note that, very generally, the same energies are produced for many of the varied keyword combinations. That said, some difference throughout exist. I will not dwell on the differences here (well, only slightly), only remark that keyword choices affect final energies when trying to perform program comparisons, and differences in keywords may alter relative energies when using two different input files for the same structure. As you might expect, when in doubt, use identical keyword sets. Just to explain what’s going on in each Excel tab (Excel file can be downloaded at the link at the bottom of this post), here’s a colorized sample case for H2. * RED and GREEN bordered – the energies compared for the relative energies of the two programs. * Gaussian-CRYSTAL Difference – The B3LYP/6-31G(d,p) Energy Differences For the “B5LYP” EMSL 6-31G(d,p) Cases (best comparisons). The bordered CRYSTAL09 keyword set (XLGRID__NOBIPOLA__20sTOLINTEG__TOLDEP__GAUSS98) is used. * LIGHT GREEN Background – These calculations don’t include the GAUSS98 keyword, which only produces a formatted GAUSSIAN.DAT file. You’d think the presence of absence of this keyword would mean nothing, so I consider this a control case for keyword sensitivity. 1. CRYSTAL is much more sensitive to the starting geometry than Gaussian when it comes to finding a stable minimum. Simply changing an interatomic distance by a tenth of an Angstrom is enough to cause a failed optimization to work (and vice versa). 2. Generally, both programs settle on the same minimum. This is easy when the systems are well-behaved (hence the hydrides). For several of the metal systems, the two programs consistently disagreed on the minimum energy geometry (which is not unexpected in some ways). You would, in fact, be wrong. Including this END statement for RHF reads as a hard END for the program. I spent far too long wondering why all of my parameters were being ignored in the RHF runs until I happened to delete the END after RHF, after which life became much simpler. Careful with your calls! 4. CRYSTAL can produce multiple minima for the same starting geometry with different keyword choices. This is not too surprising, as many keyword combinations can interact to result in different early sampling of forces and energies. That said, this is also shown to be element-specific. In the Excel file, Tabs with a “-” at the beginning contain RHF results that show differences (10ths to 1000ths of Hartrees) among the various RHF keyword choices. NiH2 6-31G optimizations, as just one example, group into two structures with a 0.46 Hartree difference in energy that differ by Ni-H bond lengths of 0.006 Angstroms. For those causally reading, 0.46 Hartree is about 1207 kJ/mol, which is a completely insane amount. This is true, but the program terminated normally. Sadly, normal mode analyses failed for both cases with the same keyword sets (no additional modification to get things to normal mode properly) and, because my concern was only testing the energies to confirm that the basis sets were properly converted, I have not pursued any of these problem cases further. Can this energy difference issue in the RHF series be dealt with? Certainly. Swapping geometries from one optimization into another input file with… conflicting keyword sets will often produce the original geometry. That said, if you were simply going into the optimizations with these small structures and did not know you were facing the possibility of local minima around a global minimum, you’d risk missing the ridiculous 0.46 Hartree of energy. 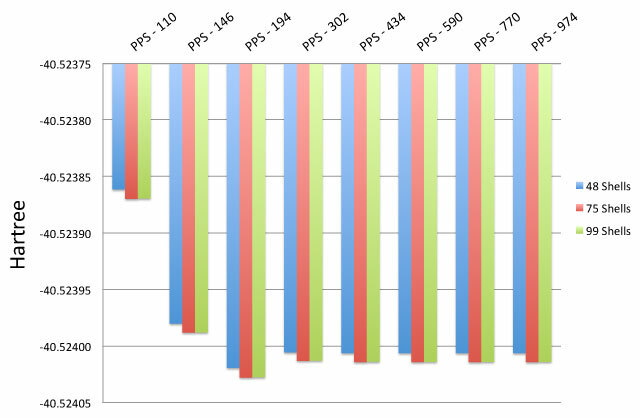 The RHF optimization variations in keyword combinations for Co2 6-31G and 6-31G(d,p), Ni2 6-31G and 6-31G(d,p), and NiH2 6-31G and 6-31G(d,p) are marked accordingly. Academically interesting but not pursued further. 5. Boron, Oxygen, Sulfur, Vanadium – Vanadium was far and away the worst dimer to deal with in RHF calculations, to the point where this post would have gone up a week sooner had it been more well-behaved. While the hydride (VH3) is well behaved, V2 settles on one of two minima and CRYSTAL and Gaussian seem to have a very difficult time deciding what that minimum is. One optimization attempt produced a CRYSTAL result consistent with Gaussian, while all others produced an alternative minimum (with the difference obvious in the bond lengths). My goal in the analysis was NOT to employ multiple convergence keywords/tools to force structures into agreement, as I wanted to find out what different keyword combinations did to affect the final energies and geometries. I suspect B2, O2, S2, and V2 could be made to agree between CRYSTAL and Gaussian. That said, efforts with ONLY the keyword sets used for all of the other comparisons in the element series reveal that CRYSTAL and Gaussian differ in the optimized geometries for these four cases in ways that they do not differ for any other element sets. Performing the same calculations on the hydrides produces excellent agreement between the two codes (and are my tests to believe that the basis set conversion was successful). Worse still (at least for the continuity of the RHF-centric presentation above), the V2 DFT energies between CRYSTAL and Gaussian are nearly identical (among the best for the larger elements) while the RHF values are far from agreement despite several geometry-swapping attempts (CRYSTAL and Gaussian see two different electronic states and see starting geometries as higher-energy versions of those two different states. A tricky problem to tackle generally). In order and in CRYSTAL format below. For those wondering, you generate the 6-31G set by taking the extra group of coefficients off the back-end of the 6-31G(d,p) basis sets. Compare any element from the two groups and you’ll see the difference. NOTE: If making similar modifications to other basis sets with added polarization or diffuse functions, you need to change the number of shells after the element in the first row of each element when you delete the bottom shell (so, for H, “1 3” for 6-31G(d,p) becomes “1 2” for 6-31G. If you’ve a problem with a CRYSTAL run with a home-converted basis set, check that first). Use the 6-31G Hydrogen result and the 6-31G(d,p) “Other Atoms” result. Simple! 1. 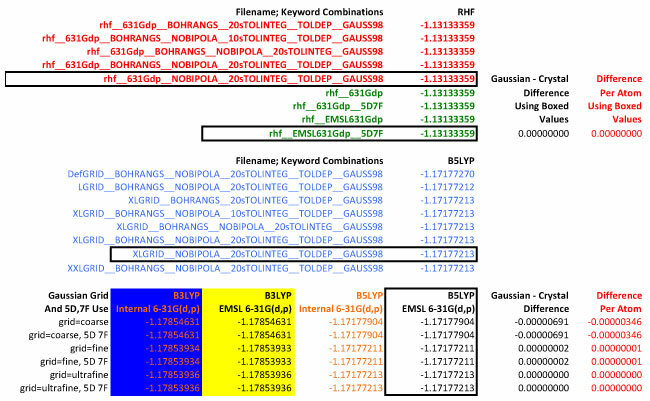 EMSL Basis Set Exchange: “The Role of Databases in Support of Computational Chemistry Calculations.” Feller, D., J. Comp. Chem., 17(13), 1571-1586, 1996. 2. “Basis Set Exchange: A Community Database for Computational Sciences.” Schuchardt, K.L., Didier, B.T., Elsethagen, T., Sun, L., Gurumoorthi, V., Chase, J., Li, J., and Windus, T.L. J. Chem. Inf. Model., 47(3), 1045-1052, 2007, doi:10.1021/ci600510j. 3. From EMSL: H – He: W.J. Hehre, R. Ditchfield and J.A. Pople, J. Chem. Phys. 56; Li – Ne: 2257 (1972). Note: Li and B come from J.D. Dill and J.A. Pople, J. Chem. Phys. 62, 2921 (1975); He is reportedly an unpublished basis set taken from Gaussian. 4. From EMSL: Na – Ar: M.M. Francl, W.J. Petro, W.J. Hehre, J.S. Binkley, M.S. Gordon, D.J. DeFrees and J.A. Pople, J. Chem. Phys. 77, 3654 (1982); Ne is reportedly an unpublished basis set taken from Gaussian. 6. CRYSTAL09: R. Dovesi, R. Orlando, B. Civalleri, C. Roetti, V.R. Saunders, C.M. Zicovich-Wilson CRYSTAL: a computational tool for the ab initio study of the electronic properties of crystals Z. Kristallogr.220, 571-573 (2005). 7. CRYSTAL09: R. Dovesi, V.R. Saunders, C. Roetti, R. Orlando, C. M. Zicovich-Wilson, F. Pascale, B. Cival- leri, K. Doll, N.M. Harrison, I.J. Bush, Ph. D’Arco, M. Llunell CRYSTAL09 User’s Manual, University of Torino, Torino, 2009. 8. Gaussian09: Gaussian 09, Revision D.01, M. J. Frisch, G. W. Trucks, H. B. Schlegel, G. E. Scuseria, M. A. Robb, J. R. Cheeseman, G. Scalmani, V. Barone, B. Mennucci, G. A. Petersson, H. Nakatsuji, M. Caricato, X. Li, H. P. Hratchian, A. F. Izmaylov, J. Bloino, G. Zheng, J. L. Sonnenberg, M. Hada, M. Ehara, K. Toyota, R. Fukuda, J. Hasegawa, M. Ishida, T. Nakajima, Y. Honda, O. Kitao, H. Nakai, T. Vreven, J. A. Montgomery, Jr., J. E. Peralta, F. Ogliaro, M. Bearpark, J. J. Heyd, E. Brothers, K. N. Kudin, V. N. Staroverov, T. Keith, R. Kobayashi, J. Normand, K. Raghavachari, A. Rendell, J. C. Burant, S. S. Iyengar, J. Tomasi, M. Cossi, N. Rega, J. M. Millam, M. Klene, J. E. Knox, J. B. Cross, V. Bakken, C. Adamo, J. Jaramillo, R. Gomperts, R. E. Stratmann, O. Yazyev, A. J. Austin, R. Cammi, C. Pomelli, J. W. Ochterski, R. L. Martin, K. Morokuma, V. G. Zakrzewski, G. A. Voth, P. Salvador, J. J. Dannenberg, S. Dapprich, A. D. Daniels, O. Farkas, J. B. Foresman, J. V. Ortiz, J. Cioslowski, and D. J. Fox, Gaussian, Inc., Wallingford CT, 2013. 9. B3LYP: A.D. Becke, J.Chem.Phys. 98 (1993) 5648-5652. 10. B3LYP: C. Lee, W. Yang, R.G. Parr, Phys. Rev. B 37 (1988) 785-789. 11. B3LYP: S.H. Vosko, L. Wilk, M. Nusair, Can. J. Phys. 58 (1980) 1200-1211. 12. B3LYP: P.J. Stephens, F.J. Devlin, C.F. Chabalowski, M.J. Frisch, J. Phys. Chem. 98 (1994) 11623-11627.